Flock on into your local Ark Country Store and pick up your 2018 Fall Flock Signs. 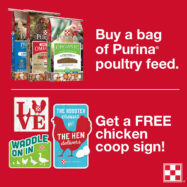 These signs are free with a 35 lb bag purchase of Purina Poultry Feed. Starting a flock this fall? Check out Purina Start & Grow. This provides optimum nutrition for raising laying chicks from hatch to laying age (18-20 weeks). This complete feed with 18% – protein and quality nutrients is perfect for a strong start and early hen development. Formulated with prebiotics and probiotics to support optimum digestive health and immune function. Also available as a medicated feed with amprolium (not an antibiotic). Started your flock last spring? It’s time to change your feed to Purina Layena. This provides optimum nutrition for healthy birds and nutritious eggs. A 16%-protein, high-calcium ration formulated with prebiotics, probiotics and yeast for top-producing laying hens once they reach 18 weeks of age. This entry was posted on Tuesday, September 4th, 2018 at 3:04 pm	and is filed under News & Updates. You can follow any responses to this entry through the RSS 2.0 feed. Both comments and pings are currently closed.